From Senator Al Franken - #1 bestselling author and beloved SNL alum - comes the story of an award-winning comedian who decided to run for office and then discovered why award-winning comedians tend not to do that. This is a book about an unlikely campaign that had an even more improbable ending: the closest outcome in history and an unprecedented eight-month recount saga, which is pretty funny in retrospect. 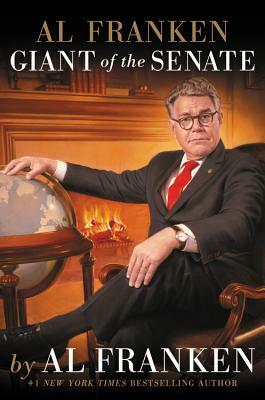 It's a book about what happens when the nation's foremost progressive satirist gets a chance to serve in the United States Senate and, defying the low expectations of the pundit class, actually turns out to be good at it. It's a book about our deeply polarized, frequently depressing, occasionally inspiring political culture, written from inside the belly of the beast. In this candid personal memoir, the honorable gentleman from Minnesota takes his army of loyal fans along with him from Saturday Night Live to the campaign trail, inside the halls of Congress, and behind the scenes of some of the most dramatic and/or hilarious moments of his new career in politics. Has Al Franken become a true Giant of the Senate? Franken asks readers to decide for themselves. Senator Al Franken has represented Minnesota in the United States Senate since 2009. Before entering politics, he was an award-winning comedy writer, author, and radio talk show host. He's been married to his wife, Franni, for 41 years-many of them happy. They have two children, Thomasin and Joe, and three grandchildren. Senator Franken graduated from Harvard College and received his doctorate in right-wing megalomania studies from Trump University.